The Blanding's turtle is among the species that Maine Department of Inland Fisheries and Wildlife and The Nature Conservancy is working to protect by posting warning signs by turtle crossing hot spots in southern Maine. A new turtle crossing sign erected by state biologists warns motorists of endangered turtles in the roadway during spring 2013 in southern York County. 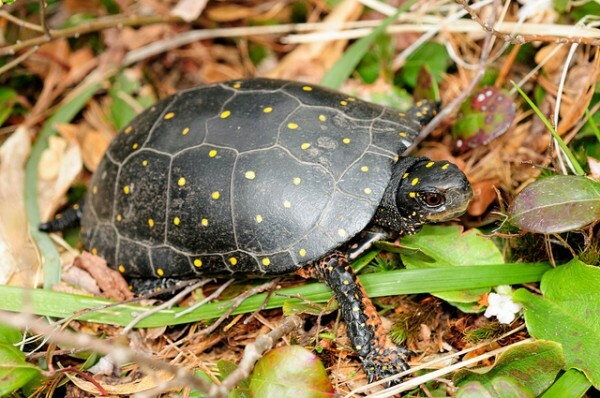 The spotted turtle, said by some to be Maine's most attractive turtle, is among the species that Maine Department of Inland Fisheries and Wildlife and The Nature Conservancy is working to protect by posting warning signs by turtle crossing hot spots in southern Maine. New animal-crossing signs are popping up along the roads of York County, and in place of the typical silhouettes of deer and moose is the shape of a turtle. State biologists are installing the yellow warning signs in strategic locations in Wells, South Berwick and York, alerting motorists to slow down and watch for jaywalking turtles. The DIF&W, in collaboration with The Nature Conservancy, is asking motorists to be on the lookout for turtles in roadways and to slow down upon spotting a new turtle crossing sign. Drivers who come across a turtle in the road and want to help are asked to pull over and, if it is safe to do so, move the turtle to the side of the road in the direction it was headed. To shoo a snapping turtle from the road, he suggests walking slowly behind it. 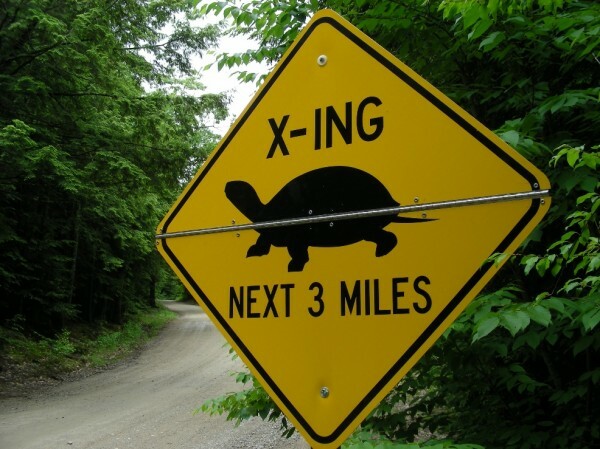 The turtle crossing signs will only be posted during turtle nesting season, May-July, when Maine’s female turtles undertake risky overland forays to reach nesting areas. Biologists hope this will maximize the signs’ impact and reduce “sign fatigue,” a local driver’s tendency to ignore a sign that is displayed year round. So far, turtle crossing signs have been specifically located to reduce vehicle collisions with two of the state’s rarest turtle species — the spotted turtle and Blanding’s turtle. Blanding’s and spotted turtles, both protected under Maine’s Endangered Species Act, can be easily identified. 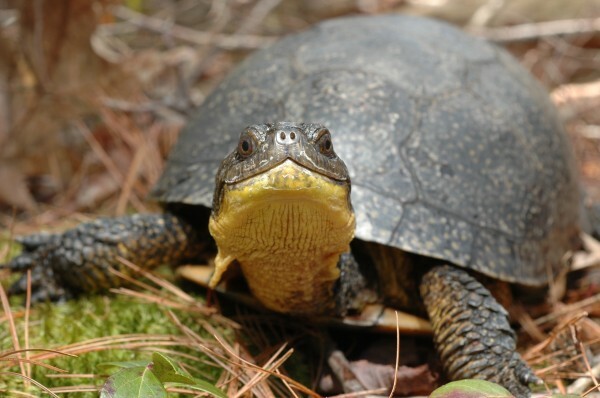 The Blanding’s turtle has a long, bright yellow neck and a high-domed shell that curves out at the edges (often described as being helmet-shaped). It is one of the two species of turtles in Maine that has the ability to close itself into its shell as protection from predators, the other being the box turtle. Many consider the spotted turtle to be Maine’s most attractive turtle, with its telltale orange polka dots decorating a smooth black shell and legs that sport bright orange, pink or reddish scales. Both species have several things working against them in the modern day world. “Spotted and Blanding’s turtles use vernal pools and pocket swamps and small shrub wetlands that tend to fall through the cracks of regulatory protection, so they’re often degraded or destroyed,” deMaynadier said. And they move between these small wetlands throughout the year, causing them to cross roads. In 2006, radio transmitters were placed of nearly 100 Blanding’s and spotted turtles in southern Maine in a study to learn how these turtles move between wetland habitats. The cooperative study by the University of Maine’s Wildlife Ecology Department and DIF&W was led by UMaine doctoral student Fred Beaudry, and the data gathered was used to identify the road crossing hot spots where the signs are being erected. Though most abundant in southern York County, these two species have been seen living farther north — Blanding’s turtles as far as southern Androscoggin County, and spotted turtles as far as western Hancock County. Southern Maine has the highest species diversity of plants and animals in the state, as well as the highest concentration of endangered and threatened species. This poses a challenge for conservationists because southern Maine also has the highest human population density and traffic volumes in the state, deMaynadier said. Based on recent population modeling, researchers believe that if people are responsible for an increase of just 2-3 percent in the natural mortality rate of these endangered turtles (for example, by causing road mortality), the local population will crash over time. Both Blanding’s and spotted turtles are extremely long-lived. The DIF&W shares turtle population data with land trusts, landowners and towns to help identify parcels of high conservation value. “A lot of land that has been conserved in southern Maine has been done specifically with turtle conservation in mind,” he said. Maine is home to seven native turtle species, as well as an eighth non-native species, the red-eared slider. Four of the eight species are of conservation concern, and that’s a pattern that’s reflected nationwide, deMaynadier said. Funding for this project comes primarily from the Loon Conservation License Plate and donations to the state’s Chickadee Checkoff. Additional research support was provided by the Maine Department of Transportation, the U.S. Fish and Wildlife Service, the U.S. Environmental Protection Agency, The Nature Conservancy and the Maine Outdoor Heritage Fund. To learn about DIF&W programs, visit www.maine.gov/ifw/. For information about Maine turtles, visit the Maine Herpetological Society website at www.maineherp.org.